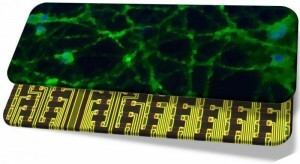 Bioelectronics deals with the coupling of the worlds of electronics and biology, and this coupling can go both ways. The natural ability for “recognition” in the biological world, such as between two complimentary DNA strands, can be combined with the awesome power of microelectronics to process signals to build powerful new biosensors. At the same time, electronic devices can help “guide” biological events, for example cell growth, thereby creating new tools for biomedical research. This cross-fertilization between the two disciplines improves our understanding of life processes and forms the basis for advanced disease detection and treatment. Tools generated in this arena, such as medical diagnostics and brain implants, will dominate the future of healthcare and help increase the span and quality of our lives. They will also play a dominant role in modernizing agriculture and in protecting animal health, our food supply, and the environment. Key to these new technologies is a fundamental understanding of the interface between electronic materials and biology. Organic electronics – an emerging technology that relies on carbon-based semiconductors and promises to deliver devices with unique properties – seems to be ideally suited for the interface with biology. The “soft” nature of organic materials offers better mechanical compatibility with tissue than traditional electronic materials, while their natural compatibility with mechanically flexible substrates suits the non-planar form factors often required for biomedical implants. More importantly, their ability to conduct ions in addition to electrons and holes opens up a new communication channel with biology. Our Department combines expertise in organic electronics and biology. Our research aims to elucidate the fundamentals of the electronic materials/biology interface and to launch new bioelectronic technologies. On behalf of our faculty, staff and students, I welcome you to our Department’s webpage and hope that you will enjoy your visit. For more stories, follow us on twitter: @esma_ismailova (Esma Ismailova), @neurophoton (Rod O’Connor). “The inside story on wearable electronics“. On integrating biology and engineering (in French). Video: Our laboratory on TV3 for an award from the French Foundation for Epilepsy Research (in French). The Wall Street Journal highlights our research on neural interfaces. Video: Our laboratory on TV3 for the development of new probes for electrophysiology (in French). Video: Learn about our OECT sensors in the Journal of Visualized Experiments.